While cultural preferences vary widely on the ideal condition of men's body hair, one would probably do well to perform, well, at least some grooming and maintenance! In the same way that most men appreciate some trimming and shaping of body hair on women (especially the armpits, and, in more intimate regions,) your woman will likely appreciate you taking the same care of yourself. And no, that doesn't have to mean shaving all the hair off your legs and chest! More often, it just means keeping things neat, combed, and all where they need to be for a more civilized appearance. However, short and sculpted you want to make your body hair, (and of course, moisturizing and treating that hair right will do wonders for the ladies as well,) it makes sense to go with a dedicated best body hair trimmer for men. They come with trimmer and shaver heads designed to remove body hair with least irritation. It is slightly different from the device you'd use on your beard or head hair: other parts of your body tend to be touchier! The ﻿sensitive blades and combs work well in such cases. It is sleek, and it is versatile. The Philips Norelco 7100 has dual-end design that it comes with two heads on the same body: a trimmer on one end, and a shaver on the other. It has a nice ergonomic chromed design with rubberized side panels for a comfortable grip in dry and wet conditions alike. A unique 3D pivoting foil head at the top follows your body curves to ensure a smooth irritation free shave. Moreover they have pre-trimmers on both sides of the foil to ensure the closest shave in the first pass itself. The shaving head consists of self-sharpening blades and the foil from hypo-allergenic materials. The foil head can get dull and may need to be replaced once every year or two. It is useful for manscaping around the groin areas, as the shaver head prevents nicks and cuts on your most sensitive regions. The trimmer head with snap on comb at the bottom features five length settings (3 mm to 11mm), to help the hairiest guys get the right length they want on their chest, shoulders, and down below. In addition, the trimmer head comes with rounded blades and combs to prevent scratches and nicks. Norelco 7100 is cordless and the rechargeable battery gives 50 minutes of use time with just one hour of charging. There is an LED battery indicator that displays full, low or charging status. It is fully waterproof, again adding to its versatility and what an individual prefers in their shaving and grooming routine. You can easily clean it with water and the cleaning brush. It also comes with a charging stand, as well as a cleaning brush. Now, this one is a big departure from the other body groomers on the list. Mangroomer ultimate pro is equipped with a much longer, flexible handle to help reach your back, and is made to be powerful enough to get through especially thick and coarse back hair. The unique patented design has been developed with over 10 years of research making it one of the best body groomers in the market. There are two interchangeable attachment heads: one 1.8 inch ultra-wide trimmer blade option for getting larger areas, and then a foil body groomer head to get more fine work, and shorter hairs. The shock absorbing flexible heads follows the contours of the body for ultimate close shave over any part of the body. The extreme reach, hinged handle design adjusts well depending on your height and arm length and can lock in place for practical use. You can extend and lock the handle at desired length using the Pro XL extension lock button. The foldable body open up to 135 degree and you can lock it at any angle with the power hinge easy button. If you want to quickly go through thick back hair, you can use the power burst button for added power to remove the coarse hair. The blades are made of hypo-allergenic materials and are ultra-sensitive for non-irritating shave on sensitive skin. It has a rechargeable battery with quick charge function for faster recharge plus a battery status indicator. It is not waterproof so be careful to use around wet hair. See it in action below. As you'd also expect for that, it's made of generally high quality with an ergonomic soft rubber grip, fast charging, and highly sensitive blades. The Philips Norelco Multigroom 3100 is one of popular body groomer today as it is extremely versatile, as well as affordable. All-in-one, the 3100 works for head hair, beard and mustache trimming, nose hair trimming, and detailing. It has 3 heads (full size trimmer, detail trimmer, nose trimmer) and 2 combs (beard and mustache comb and hair comb). The full size trimmer can be used on your beard, body and head. 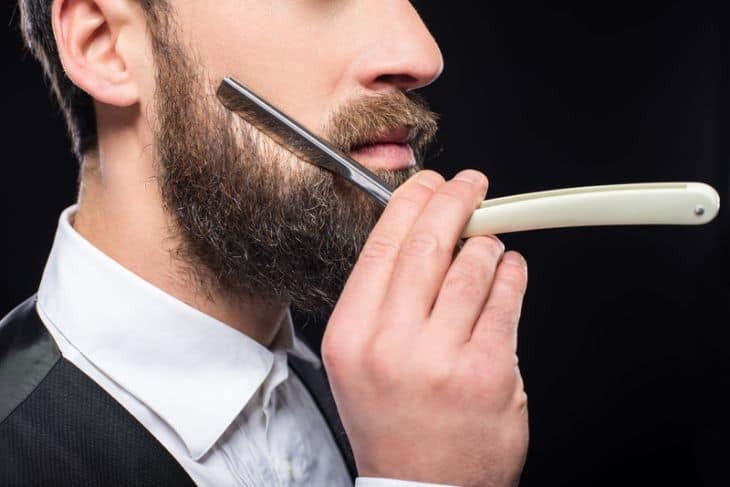 The beard and mustache comb can be used with the full size trimmer to style and trim your beard. It's sleek, easy to use, and the heads are adjustable to 18 different settings (1 mm to 18 mm) for precise lengths. The hair comb lets you get a haircut and offers 18 length settings ( 3 mm to 20 mm) with 1 mm precision. You’re of course still going to need the skill and attentiveness to make yourself look the way you want to look, but this is a simple yet powerful multi-groom product. It saves on cost by using a cord charger and lacking a dedicated charging/cleaning stand, but it's waterproof and safe to clean under the faucet and with a brush anyway. The charge lasts 35 minutes for 10-hour charge. If you want a good, simple, solid tool for maintenance and styling today, this is a great way to go. Remington's trimmer is also a wonderful option for all round body grooming. It has a full size trimmer head and a foil body shaver head. The body shaver head is made of hypo-allergenic foil for a comfortable close shave on sensitive skin. The trimmer head when used without the comb is useful for styling facial hair, trim sideburns or neckline. For more accurate beard or stubble trimming you can use the combs with full size trimmer. It comes with five different length guide combs, making it easy to get the exact length and fading styles you want on your face, and on your body. The 5 snap-on beard and stubble combs has a fixed length setting of 1.5, 3, 6, 9 and 12 mm for styling your beard easily. Like the 7100, it runs cordless, and its lithium battery has a 70 minute run-time after a full charge time of 4 hours. The WetTech feature makes it fully waterproof and a rubberized non-slip grip is also there for maximum control. Oh, and it is usable wet in the shower, as well, including with gel or foam. It's simple, it's compact, and we find the little hanging loop on the end useful for storing it conveniently in the shower. Due to its small size, we like the Remington as a travel option. Powerful rechargeable battery ,waterproof and can be used with gel or foam. The Gillette Proglide Styles is another affordable, option for face or body hair styling. It has been dermatologist tested, and made to be kind to sensitive skin. Gillette seems to value that feature highly, reflected by their use of their “ProGlide” technology, which basically means the manual blades are made to slide easily over the skin. This groomer is powered by a trimmer engineered by Braun and a shaver with fusion proglide power by Gillette. The 3 in 1 refers to close shaving, even trimming and fine edging capabilities of the groomer. The shaver head features 4 blades with a comfort guide for the closest shave and can be used with or without power option. The precision edging blade lets you define your style and give finishing touches. The shaver blades for this one are disposable, by the way; one big difference between it and its others on this list, though certainly not a deal breaker. It combines an electric trimmer and a manual razor into one tool, letting you conveniently give yourself a close shave for full smoothness where you want while fading and styling other hairy areas more precisely. It comes with three different exchangeable length combs to work on your beard or stubble. This device essentially acts as a "finisher" to complete detailed styling once someone has finished the most general shaping. Also, it is shower safe with good grip, making it one of smallest versatile and maneuverable groomers around. It runs on a single AAA battery that makes it ideal for travel although it will last only a month. This is a great option for those who don’t have much body hair and looking for a quick trim and shave. There are full body grooming kits for men that can do a lot more than just trimming or shaving your body hair. Grooming kit models come with nose hair trimmer heads , detail trimmer and multiple comb length attachments in addition to the basic trimmer and foil shaver. They offer good value for money and you should consider them if you are looking for an all round solution. Here are top 3 best male grooming kit brands available today. Although most groomers do a pretty good job in removing body hair, still there are essential features that vary with different brands and models. Here are few things to consider before buying a body groomer. Trimmer Head and Foil head – A body groomer can come with a trimmer head or a foil shaver head or both. The trimmer head is useful for areas like beard, back hair, chest hair and legs. They usually come with an adjustable comb that lets you trim hair to desired length. The foil shaver head is more useful for sensitive areas like inner thigh, chest areas and groin areas as the foil protects the skin from blade action. Look for hypoallergenic foils for a less irritating shave. Using a trimmer directly on sensitive areas is not recommended as it can cause cuts or nicks in the process. So choosing a groomer with required head depends upon whether you need to trim or want to shave as well. It will be best to choose a model with interchangeable trimmer and shaver heads for more versatility. Design, Reach and Grip – A good body groomer should have a nice ergonomic design that makes it easy to hold and use all over the body. It should be compact and easy to maneuver across the body for effective hair removal. Now there are trimmers with extendable handles so that you can reach the back hair easily. So groomers with additional reach is a bonus for those who have thick back hair. Smaller sized groomers let you reach the inner sensitive areas without causing any nicks or cuts. Another useful feature to have is a rubberized grip that makes it comfortable to hold and use, even in shower. Hair Type- Choosing a trimmer also depends on your hair types like straight, curly or thick hair. If you have straight thin hair you can choose less powerful trimmers that can do the job. For thicker hair opt for more powerful groomers. Curly hairs is best tackled with adjustable combs that guide and trim the hair to desired levels. Wet and Dry – Though most body groomers work fine on dry skin, having a fully waterproof model is always an advantage. It is great for those with sensitive skin and also creates less mess when used in shower. Most waterproof models will be cordless as well which make them a good travel companion. Battery- Trimmers are available with rechargeable or normal batteries. Rechargeable batteries made of Lithium-ion (Li-ion) have shorter charging time and lasts up to an hour of use. Trimmers with Nickel Metal Hydride (NiMH) batteries are cheaper and have much longer charging time of 8 -10 hours and lasts 50-60 min. Trimmers that run on alkaline AA or AAA batteries will be less powerful and are useful if you travel frequently and don’t have time to charge. Some trimmers have Nickel Cadmium (NiCad) rechargeable battery which have only half capacity of NiMH batteries. NiCad and NiMH are older generation batteries in comparison to the latest Li-ion batteries. Extras – Useful extra features to look for are additional trimmer heads like nose trimmer, multiple comb attachments, precision lengths, LED battery display, interchangeable heads, self-sharpening or replaceable blades, carry pouch and cleaning brush. Check this demonstration video to see how to use a bodygroomer the right way. And there you have it. If you knew "man-scaping" was something you wanted to get better at or get into altogether, but weren't sure how to get started, any of these ten options would set you on the right path. We picked the Philips Norelco 7100 as the best body hair trimmer for men and you can’t go wrong by choosing it. Go forth with whatever option you choose, get that jungle under control, and as always, happy grooming: may yourself and your lady thank you. They're shower safe, they give you different options for length and different parts of your body, and they're made specifically to work safely on the most sensitive parts of your body.